On Friday, the Denver Nuggets announced their roster for the 2016 NBA Summer League in Las Vegas from July 8-18. 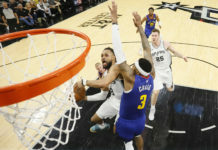 The Samsung NBA Summer League will feature a tournament-style schedule and conclude with a Championship Game as well. 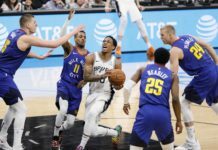 The Nuggets’ Summer League team should be an interesting and fun bunch, as it includes starters Emmanuel Mudiay and Gary Harris; all four 2016 NBA Draft picks; a few local players such as Antwan Scott, Josh Adams and Josh Scott; and former BYU standout Jimmer Fredette. “This group is fun because, with this particular group that we assembled for the summer, we’ve got a lot of guys that can shoot the ball and a lot of guys that can make plays,” assistant coach Micah Nori. Similar to last year, assistant coach Nori will assume head coaching duties, and he plans to use it as a chance to get better. 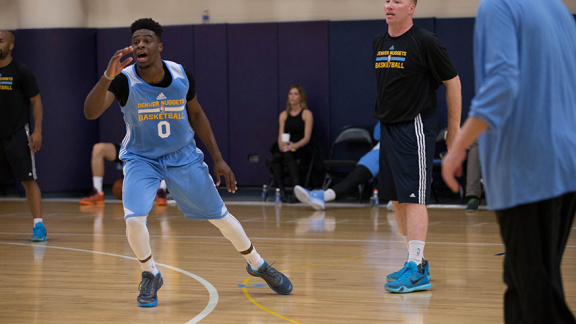 Sunday evening, the Nuggets started their Summer League minicamp, a four-day event running from (July 3rd-July 7th). And it got pretty intense. So intense, in fact, that after practice, second-round selection Juancho Hernangomez and general manager Tim Connelly played a bit of one on one, in which Hernangomez ended up with a nose bleed. A surprise to some is that second-year starter Emmanuel Mudiay is on the team. He says he plans to use this time to get better, but more so as a leader. The team will also hold two-a-day practices on the fifth and also the sixth. The time will also be beneficial to players like Jamal Murray, who still need to get used to the altitude. It was a difficult decision for Murray to choose not to play for Team Canada in the Olympics, but he ultimately went with the Nuggets. One thing is for certain, this team will be fun to watch. 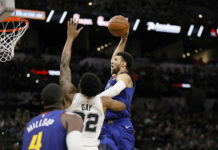 For those wanting to tune into the games from home, ESPN and NBA TV will provide non-stop coverage and will televise all 67 games at the annual showcase of future NBA stars giving fans a chance to watch each second.